The casino is located a short walk from the Market Square and just off Bridge Street. It is 5 mins away from Northampton train station. 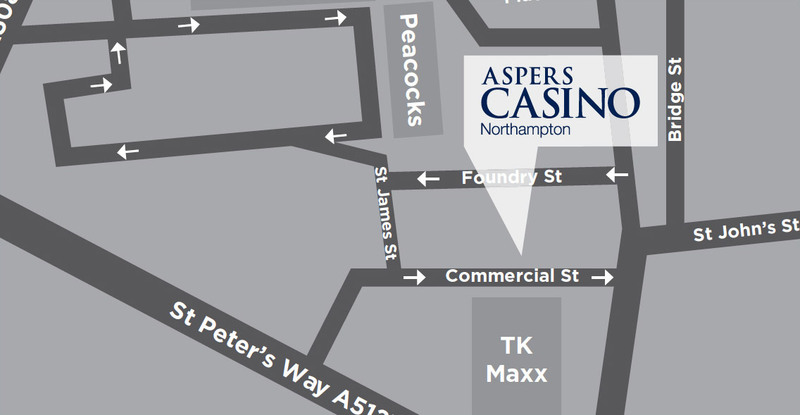 Aspers is next to the St. Peters’ Way shopping complex and located next to Argos and TK Maxx. Where can I park at Aspers Casino? Parking is free after 6pm – 8am in the top half of the short stay car park which is next to Argos. For all enquiries please call our Guest Relations Desk on 01604 623 580. For all functions and events enquiries please call 01604 623 580.